Ideal for spreading over toast or filling cakes, tangy lemon curd isn’t as hard to make at home as you might think – give it a go! Put the butter, sugar, lemon rind and strained juice in the top of a double saucepan over simmering water, or in a glass bowl over a pan of simmering water. Stir until the sugar dissolves and the mixture is hot, but not boiling, then stir about half a cupful of this on to the beaten eggs. Pour the egg mixture into the buttery mixture and stir continually over the heat for 6-8 minutes, or until it thickens. It should coat the back of a wooden spoon. 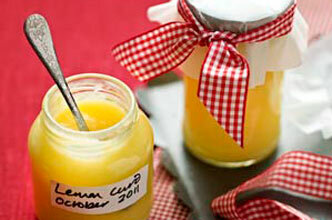 Pour the lemon curd into small, sterilised jars. Seal, label and store in a cool place.